Sick of the same old boring links? Want to mimic Facebook’s wall links in your WordPress posts? WP Lynx allows you to do just that. WP Lynx is a WordPress plugin compatible with WordPress versions 4.2 and up. This plugin allows you to create stylized links akin to those in Facebook. These stylized links, known as lynx prints, can contain a thumbnail image of any of the images on the linked page, plus a short excerpt from the page. The images are automatically cached on your server (no hot-linking), and the content is intelligently scraped. Below is an example of a lynx print. WordPress › Blog Tool and Publishing Platform http://wordpress.orgWordPress is a state-of-the-art publishing platform with a focus on aesthetics, web standards, and usability. WordPress is both free and priceless at the same time. Disable any previous version of this plugin. Enable the WP Lynx plugin in the administration panel under the Plugins > Installed section. Continue onto the Basic Usage section, or follow instructions given by your theme (if applicable). Using WP Lynx is very simple. Just start a new post or page (or edit an existing post or page) and click on the “Add Lynx Print” button next to other WordPress media buttons. Now enter the URL to the website or page that you want to link to. Hit the enter key to begin fetching the Lynx Print. After the Lynx Print has loaded, and the Enter URL field clears, you may enter another URL to fetch. After the pages have been retrieved you should have something similar to the picture above. The pictures are changeable, just use the arrows to thumb through the available pictures. The same goes for the text field, which you may manually edit or thumb through some pre-selected paragraphs from the linked site. When you are ready to insert a Link Print, just click the “Insert Into Post” button (or the “Insert into post” button at the bottom to insert multiple Link Prints simultaneously). Pressing the “Insert Into Post” button for a specific Lynx Print will send that Lynx Print to the post, leaving the others in the Lynx Print manager. These will remain until they are either deleted (using the “Delete” button) or the page is reloaded. If you go to the HTML tab in the editor you’ll see that WP Lynx generates pure HTML. This gives the user full control over their Link Prints. Examples on some advanced usage situations are available in the documentation. Behavior change: Migrated to WP HTTP class for URL parsing, removing external library dependency. New feature: Support for simultaneous multiple URL fetching added. New feature: Support for image previews of PDFs added for users with Imagick. Bug fix: Fixed issue where Lynx Prints would not insert into the post. Bug fix: Fixed issue where sites without a title tag would cause a PHP warning. Bug fix: Fixed permissions issue on settings save in the settings page. Bug fix: Fixed additional PHP error in the uninstaller. Bug fix: Fixed PHP error caused by calling the wrong class in the uninstaller. Bug fix: Fixed alignment issue of the main content of the settings page on WordPress 4.4. Bug fix: The Lynx Print adding interface now handles server side timeouts more gracefully. New feature: Added “Get” button to Lynx Print modal. New feature: Migrated to WordPress.org Language Pack compatible textdomain. Bug fix: Moved away from deprecated media_buttons_context filter. Bug fix: Fixed issue where the user specified Lynx Print template was not being used when inserting Lynx Prints. Bug fix: Added workaround for servers that by default send images with transport compression. Bug fix: Fixed issue with adding Lynx Prints when there is more than one editor field. Behavior change: Requires PHP 5.3 or newer. Behavior change: Requires WordPress 3.8 or newer. New feature: New Lynx Print adding interface, a la the new media interface in WordPress 3.5. New feature: Allow users to configure number of redirects followed by the scaping engine. New feature: Migrate to the latest mtekk_adminKit. New feature: Reorganized/written core plugin files. New feature: Include minified scripts and styles for non-development environments, see SCRIPT_DEBUG. Bug fix: Added workaround which should make it difficult for new Lynx Prints to be inserted within existing Lynx Prints in a post. New feature: Added support for site thumbnails using Snapito! New feature: Migrated to latest mtekk_adminKit, brings new tab style to settings page. New feature: Simplified and reorganized the settings page. Bug fix: Fixed some PHP warnings from llynx_scrape when the scraped site did not behave as expected. Bug fix: Fixed PHP warnings from llynx_scrape when the site contains img tags without src fields. New feature: Support for Open Graph protocol og:image and og:description. New feature: Added a warning message on the Lynx Print adding screen alerting to thumbnails being disabled due to directory permission issues. Bug fix: Improved content scraping algorithms to handle newlines in odd places (mid tag). Bug fix: Fixed issue with the Show/Hide links not working correctly. Behavior change: Improved content filtering, should reduce the chances that garbage is selected as paragraph stubs. Behavior change: Included style is now a separate CSS file rather than an inline CSS file. Behavior change: Import/Export/Reset tab moved under the admin bar Help menu. New feature: More useful Help menu, utilizing the new WordPress 3.3 Help menu. Bug fix: Tabs on the settings page are now rounded for all “modern” browsers, including Firefox, Chrome, and IE9. Bug fix: Tabs on the settings page are now remembered between setting saves (including multiple saves from within the same tab). New feature: Templated Lynx Prints now available. New feature: Tinyurl URL shortening now available. New feature: TinyMCE button added when in full screen editing mode. New feature: Added Help tab to Lynx Print adding screen. New feature: Any whitespace character may be used to separate multiple URLs. Bug fix: Fixed issue where PHP warnings would arise if the remote server did not return the expected data range. Bug fix: Permissions issues for the WordPress Upload directory are handled more gracefully. Bug fix: Installer now works properly for first time users. 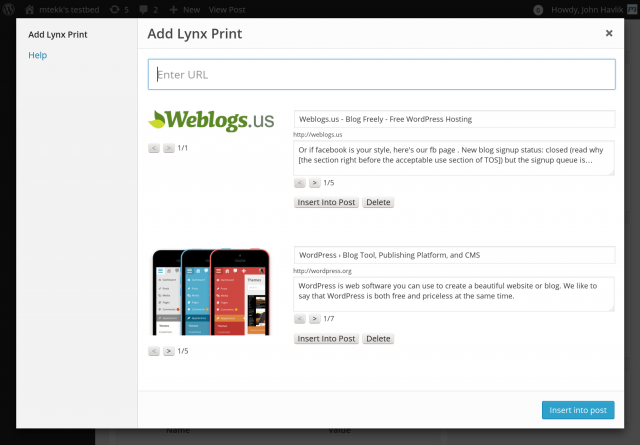 New feature: Lynx Prints are now styled in the WordPress visual editor. New feature: Users are now warned if settings are out of date, allowed to do a one click settings migration. New feature: Can now undo setting saves, resets, and imports. Bug fix: “Blank” images should no longer load as thumbnail candidates. Bug fix: Improved CURL Error reporting. Bug fix: Fixed issue with non UTF-8 or ASCII encoded sites. Bug fix: Fixed issue with CURL and PHP in safe_mode. WP Lynx is released under the GNU GPL 2.0 license and comes with absolutely no warranty. By downloading WP Lynx you agree to the terms of the GNU GPL 2.0 license. I installed the 1.1.o version of WP Lynx. (Thanks) However, when I insert a URL and press “Get”, the little turning circle appears, nothing else happens. No error message is displayed. Can you open your browser’s inspector while trying to “Get” they URL for a Lynx Print. Under the Net/Network tab, I’m interested in seeing what the request and response to the POST to wp-admin/admin-ajax.php with the POST field of ‘action’ set to ‘wp_lynx_fetch_url’. On slow servers it may take awhile for a response since the server has to do the URL fetching, processing and then send the data back to the browser. Can you email me directly, then I can respond and attach the data I captured. There is too much to post here. On other URls, I think the curl_exec all is hanging. The open_basedir thing is a little concerning since if WP Lynx is having issues with it, you will not be able to use the media uploader either (WP Lynx should be using WP API calls for all file system related stuff). Do you know if CURL works on your PHP install, since it seems that may be the root of this issue? Unfortunately, WP Lynx currently uses techniques that only CURL can do, though maybe that will have to change for the sake of wider compatibility. Thanks for digging into this further. The script error sounds like a bug and I’m tracking that in this GitHub issue. Can you provide me with a sctipt to test curl independently? I am a developer by trade (c++, not PHP or js) but I am happy to help you debug this as best I can. Oopse, that would be a bug on my part. I’ll roll it into a 1.1.1 bugfix release. Is there a way to have Lynx parse URLs automatically? In other words, I use IFTTT to create posts with a single URL inside – I’d love a plugin to automatically turn those into pretty Facebook-style URLs without having to login and do it manually.